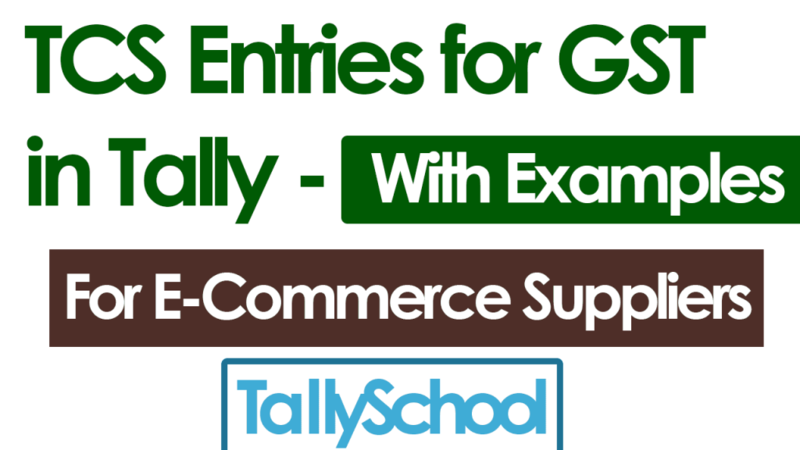 Today, I am going to explain you TCS entries for GST in Tally ERP 9 which was recently made applicable by the Government of India. I will also give you examples for your better understanding if you are the person who sells through e-commerce portals such as Amazon, Flipkart and so on. On 13th September 2018, Government of India notified the applicability of TDS and TCS provisions under the GST law from 1st October 2018. But in this article we are only going to talk about TCS provisions applicable to e-commerce companies and the people who sell their goods and services via these e-commerce companies. According to these provisions, in simple words, every e-commerce operator (Amazon, Flipkart etc.) will deduct 2% Tax Collected at Source (TCS) which comprises of 1% CGST and 1% SGST or 2% IGST before making payment to the e-commerce supplier. If you are confused, don’t worry as I have explained everything in detail with examples. Just keep reading ahead. These GST provisions are applicable to both the e-commerce operators and e-commerce suppliers. What are e-commerce operators and e-commerce suppliers? Let’s take an example here. You are selling mobiles through Flipkart. In this case, you are an e-commerce supplier because you are supplying goods i.e. mobiles through Flipkart to the end consumer. Flipkart is an e-commerce operator because it operates a platform through which you are able to sell the goods to the end consumer. It is the responsibility of every e-commerce operator to collect the TCS before making the payment to the e-commerce supplier. TCS will be deducted on the taxable value of the goods or services excluding the taxes. For example, if a mobile is of ₹10,000 and GST on it is 12% which is ₹1,200 so the total amount payable by the customer will be ₹11,200. TCS will be deducted on ₹10,000 and not ₹11,200 because ₹10,000 is the taxable value and not ₹11,200. For creating TCS entries for GST in Tally ERP 9 for e-commerce, we are going to look from the angle of an e-commerce supplier. The reason for this is because there are thousands of e-commerce suppliers like you and me who are trying to make a living by selling goods and services online. Many of them are selling goods online for the first time and they are taking huge risks in their lives. They are trying to do something themselves on their own. And for that I respect them because it is not easy to do something on your own. It takes enormous courage and commitment to do that. By writing this post, I will be helping those thousands of e-commerce suppliers who are trying to do something on their own. I also respect big companies like Amazon, Flipkart etc., but they already have people to take care of everything and these small entrepreneurs might not have that kind of expertise. And, therefore I am doing my bit to help them. Anyway, let’s get back to the topic and look at the TCS entries for GST in Tally for e-commerce suppliers. As I said, an e-commerce supplier is a person who sells his or her products or services through Amazon, Flipkart etc. You list your products on the e-commerce operator’s website. The customer sees the product, places the order and makes the payment. You deliver the goods and the customer confirms the delivery. E-commerce operator deducts its fees + taxes (GST + TCS) and gives you back the remaining amount. Today, we are going to look specifically at the 4th step above and how we can pass its accounting entries in Tally with GST. Let us take an example and go ahead with it so that you can understand it in a crystal clear way. Amit is selling mobiles on Amazon. He sold a mobile phone worth ₹10,000 + GST @ 12% on Amazon to a customer named Ritika who is from Madhya Pradesh. Amazon deducted its fees at 10% + GST @ 18% on it. It will be ₹100 + ₹18 = ₹118. Now, as per the current GST law, Amazon should have to pay you the remaining amount which is ₹11,200 – ₹118 = ₹11,082. But due to the new TCS amendment under the GST law, Amazon will deduct 2% TCS i.e. 1% CGST and 1% SGST on the taxable amount and will transfer the remaining amount into your bank account. So, now it will be ₹11,082 – ₹200 (2% of ₹10,000) = ₹10,882. CGST, SGST and IGST ledgers – These are called GST Taxation Ledgers and I have described the entire process of creating GST Taxation Ledgers in Tally here. Sales Ledger for Amazon Sales – This is the ledger that we will use for identifying our sales. We can call this as Amazon Sales – 12% in this example. A ledger for e-commerce operator i.e. Amazon – This ledger is used in the option Party A/c because this is the person through which we are selling our goods online. This is a Sundry Debtor’s ledger in Tally. A Stock Item for Mobile – This is required for creating stock items in Tally or we can say products in Tally. Before we move ahead, I want you to be clear about simple e-commerce sales entries in Tally. I have created a separate post and a video for that and therefore I am not going to repeat the same explanation here. You can click on the above link on simple e-commerce sales entries in Tally and you can learn accounting entries in Tally for selling goods online. Now, let’s start with TCS accounting entries in Tally for E-commerce Suppliers. First, let’s say, Amit sold the mobile for ₹10,000 + ₹1200 (12% GST) = ₹11,200 to Ritika. We will create an accounting entry for the above transaction in Tally. From Gateway of Tally, go to Accounting Vouchers. Select Sales Voucher from the right hand side or press F8 for the shortcut. Select appropriate date and in the option Party A/c Name – select Amazon. Now, a yellow window will appear and in there in the buyer’s details fill in the details of the customer which you want to show on the invoice to the customer. We will put it here as Ritika and her address will be 1, Shantivan, Bhopal, Madhya Pradesh. Now, select Mobile and put the rate at ₹10,000 and below there select IGST because this is an inter-state transaction. IGST will be automatically calculated and that is a sign that you have done the accounting entry in Tally with GST in a correct way. This is the first sales entry in Tally with GST. This entry is required to be created or passed in Tally when you sell something online. Now as per our example above, Amazon will give Amit ₹10,882 after deducting all the fees, GST and TCS in the form of GST itself. First, we will do the accounting entry for the deduction of fees, GST and TCS by Amazon. We have to create a ledger in Tally called Amazon Fees which will be under Direct Expenses since these are the expenses that are directly related to our business. The reason for creating these ledgers is that we can identify the TCS that is deducted in the form of GST. Otherwise, it is just GST deducted in a different manner. By the way, these ledgers are created in the same way as we create GST Taxation Ledgers in Tally. We are now going to look at TCS credit under GST and its accounting entry in Tally. I am going to reveal you the best thing about Tally right now. And, that is you don’t have to create a separate entry to take the credit of GST and TCS in Tally. The entry for taking TCS credit was the same journal entry that we created above. You just have to alter the above journal entry a little bit and that’s it. This is how you have to do it. Open that journal entry and click on Stat Adjustment or press ALT+J which is the shortcut in Tally for Stat Adjustment. Side Note: Decrease of Tax Liability is not same as Increase of Input Tax Credit. Now, this entry will also show up in the GSTR – 2 in Tally which is used for recording purchases under GST. This is how the TCS entries for GST in Tally ERP 9 for E-Commerce are done which will be applicable for October 1, 2018. Now, we are going to look at the relevant returns that are needed to be filed under GST for TCS deductions. A monthly return in Form GSTR-8 needs to be filed. That means every month GSTR-8 is to be filed. Also, an annual statement in Form GSTR-9B is to be filed. But, there are good news for you. You don’t need to file any of the above returns. Only e-commerce operators need to file this extra monthly return and the annual statement. That means only companies like Amazon, Flipkart etc. need to file these returns. E-commerce suppliers like you and me do not have to file these returns. It will not show up in your Tally also. This also means that you as an e-commerce supplier has to do less TCS entries for GST in Tally overall. With this move, now e-commerce operators will have to compulsorily deduct TCS before making any payment to e-commerce suppliers. Because of this, both the e-commerce suppliers and operators have to get registered themselves with GST if they want to take the credit of TCS which they all want to take. So, this is a step to include all the people in a supply chain in GST tax net. Now, there will be less evasion of tax as most of the people will be registered with GST. Also, the matching of invoices will remove any small chance of evading or avoiding GST. It is a good move since there are a very few e-commerce operators as compared to e-commerce suppliers and therefore, GST department can track anyone directly through an e-commerce operator. I have explained the exact process of TCS Entries for GST in Tally for E-Commerce right from the sales to the customer to taking the TCS credit. One more thing, I would like you to note is that Tally Solutions has not yet released the updated version for TCS deduction by e-commerce operators so this post is before the updated version. But, even without the updated version, you can still file your GST Returns with this Tally ERP 9, Release 6.4.7. Lastly, if you have any doubts or difficulties or questions that you want to ask, please comment down below and I will be happy to help you out. I reply to each and every comment. P.S. – If you have a better way of creating or passing TCS entries for GST in Tally, please let me know in the comments so everybody can benefit from it. In this case – specifically for TCS on e-commerce transactions – TCS is always deducted on the taxable amount which means before taxes are applied. So, there is no question of TCS to be treated as inclusive of taxes transaction. For example, if a product is sold at ₹10,000 inclusive of 12% GST then taxable value of the product will be ₹8,928.57 and TCS will be deducted on this value. TCS at 2% of ₹8,928.57 will be ₹178.57. You are correct and that is what I am exactly saying. TCS is deducted on basic value and that means the taxable value. You can put the sell voucher series as per your requirement. You can customize it as you want them in tally. I really liked your article. Even I am also ecommerce supplier. Thanks for your valuable article. It helped me resolved so many of my issues. But I have one more query to ask. 3. At the time of each payment made by Amazon. If I am not able to describe my issue in detail, you can call me on removed for security. Hope to get reply as early as possible. I am happy that I was able to solve a lot of your issues regarding e-commerce in Tally. You have described your query in a very good way. The answer to your question is point no. 2 because as soon as the invoice is raised, your liability to pay GST on your sales and e-commerce operator’s liability to pay TCS that was deducted from you arises. I am sure I have answered your question correctly. If you have any other issues, please let me know. Sir doubt is how much to pay gst? Now someone are still saying that you will have to pay 1200 to govt and Amazon will refund 218 to you. Amazon will not refund you ₹218 because it will be your GST credit. If in monthly invoice generated by Amazon, you are not seeing the TCS details, there are chances that you will see it in invoices of individual items. 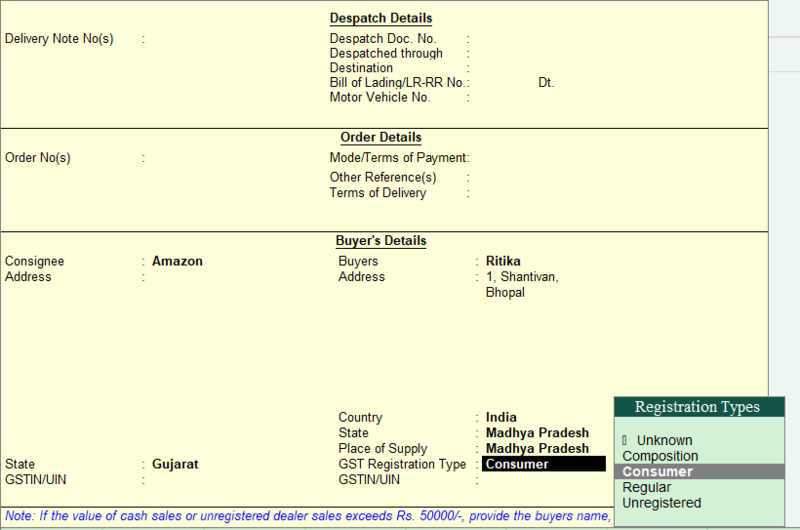 If you are still not seeing TCS anywhere in any invoice (which is highly unlikely), then Amazon is not deducting TCS. Kya confusion hai TCS ki Amazon entry tally mai? Please tell me so I can explain you better. I am answering the question assuming that I am the hotel. It gives me immense pleasure by visiting your so helpful blog. I boarded on amazon last month and found that 2 Tax Invoives dated generated by Amazon to me (e-commerce supplier) as detailed below. Im trying to understand how to pass these two entries in my Tally ERP 9, thru Purchase Entries or thru Journal Entries in my Tally? Pls throw some detailed lights on this as I need to file my return in this month. The entry for the above invoices will be a Journal Voucher in Tally because Amazon or any other e-commerce operator generally deducts the amount of fees and GST before finally transferring the amount in your bank account. Similarly in the second invoice, you have to do the exactly same thing. You just have to add the GST amounts and rest will be all fine. The accounting entry for commission that you have done is correct but you have not configured ledgers properly as per GST in Tally. Nature of Transaction means taxable, exempt or NIL. You have to select that while passing the entry. For that you have to enter the nature of transaction in the sales ledger. Place of Supply means the place from where you are getting the service which means the state where your supplier is located. For that, you have to enter the state in the ledger of Travelguru. Thanks a lot for all the video’s you have uploaded on your youtube channel are very helpful. I have a problem when I am doing entries in journal voucher GST and TCS aren’t calculating automatically please guide. In Journal Voucher in tally, Tally does not automatically calculate GST and TCS because it becomes an accounting entry.